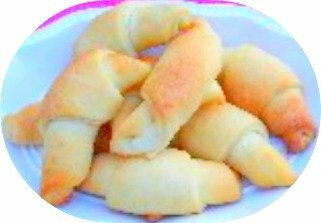 The aroma of these homemade rolls will keep family hanging around the kitchen, the most popular room in the home. Top with Sesame or Poppy Seed before baking, if desired. Slather them with butter, let them dissolve in your mouth, and you will know the time that it took to make them was a wise choice. Mix yeast and 3 3/4 cups of the flour in a large mixing bowl. Set aside. Reserve 1/2 cup flour for later use. Stir milk, sugar and salt in a saucepan until sugar is dissolved. Add warm liquid (temperature should be 120-130F.) to flour in mixing bowl. Add egg. Beat mixture on medium speed for 30 seconds. Scrape down sides and beat another 30 seconds. Sprinkle part of the reserved flour on pastry cloth or cutting board. Place dough ball in the center and knead it for 8-10 minutes. As your dough becomes sticky while kneading, work in the reserved flour, until it is all used up and dough is smooth and elastic. Place in a lightly greased bowl, cover and let rest 10 minutes. Roll each one on a lightly floured pastry cloth or board into a 10-12 inch circle. Cut circle into 8 pie shaped wedges. Starting with the outer edge of the wedges, roll them up towards the center, curving the ends slightly to create a half- moon shape. Place crescents on a buttered cookie sheet 2 inches apart. Let rise in a warm, draft-free place until double in bulk. Usually takes 40-50 minutes. Brush tops with softened butter. Bake in a preheated oven 350F. 12-15 minutes until light golden brown. DO NOT OVER BAKE! These Yeast Rolls will remain fresh by putting in zip lock bags and refrigerating a few days. They can also be frozen. After placing rolls on a cookie sheet to rise, brush tops and sprinkle with poppy seed or sesame seeds and let rise. These yeast rolls may be shaped in other classic rolls shapes. 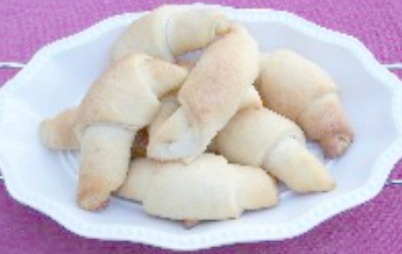 For clover leaf shapes, after dividing the dough into 3 equal parts as above instructions, shape rolls. Make 3 small round balls to fill each regular sized buttered muffin tin. Place the balls side by side in the tins, brush tops with melted butter and top with sesame or poppy seeds if desired. Let rise until dough has doubled in size. Bake per instructions above. These make very pretty and delicious rolls. Four balls give you the "lucky leaf" clover design. To get the Parker House Rolls shape, after dividing the dough shape each section into a rectangular shape. Slice the dough into equal equal parts of the thickness you desire your rolls. Place on buttered cookie sheet 2 inches apart. With a dowel (you can use the round handle of a wooden spoon) make an indentation in the center of each roll making a pocket deep enough to add a pat of cold butter. Brush the rest of the top of roll with melted butter. Let rise until doubled in size and bake per above directions. After dividing the dough into three parts, rolls each piece into a long rope. The length and diameter of the rope will depend on how thick you want the rolls to be. You can make a skinny, long rope or a thick rope, remembering the dough is going to rise double before you bake it. The dough continues to rise as it is baking. Tie the ends once, place 2 inches apart on buttered cookie sheet. Brush tops with melted butter and let rise until double in bulk. Pinch off pieces of dough one half the size of a classic dinner roll you desire. Using your hands roll the pieces of dough into balls and place them in a buttered biscuit baking pan 1 inch apart. Bake as per above instructions. Pull dinner rolls apart and serve in a bread server or on a platter. TIP: If Yeast Rolls are to be held a few minutes before serving, cover lightly with a clean linen cloth until ready to serve. They will not dry out as they would if left in a warm oven. If they are to be held out more than a few minutes, cover them with aluminum foil and place in a warm oven.